Love is a meme. The Beatles made great music is a meme. Smart clothes is a meme. Smart is a meme. Clothes is a meme. Depression, as a description of a weather system, is a meme. Weather system is a meme. Weather is a meme. System is a meme. Depression, as a description of a mental state, is a meme. Mental is a meme. State is a meme. Schema is a meme. Meme is a meme. Schemas and memes are arguably two reflectors of the same concept – ideas! (from the instinctive and unspoken structural to the metaphysical abstract) – in different contexts. The theories around both terms emphasise the enormous impact of ideas upon the human psyche. A schema can be defined as any cognitive construct or encoded packet of information in the mind-brain. A meme is a unit of cultural information, such as a cultural practice or idea, that is contained in a medium of communication – eg: a book – or is transmitted verbally or by repeated action (behaviour) from one mind to another. Unfortunately, despite their importance to understanding how humans make sense of and interact with the world, there is a lot of confusion about ‘memes’ and ‘schemas’. Some of this has been created by the *experts* themselves! More often than not schema is seen as internal. Yet Hiroko Nishida (1999), for example, has talked about ‘cultural schemas’ – in other words, memes. Susan Blackmore (1999), arguably the world’s leading proponent of Memetics (the study of how memes are transmitted between people as virus-type ‘infections’ of the mind), has argued that memes are internalised in the brain as neurobiological structures – in other words, they become schemas. So are the terms interchangable? The answer is: not entirely. 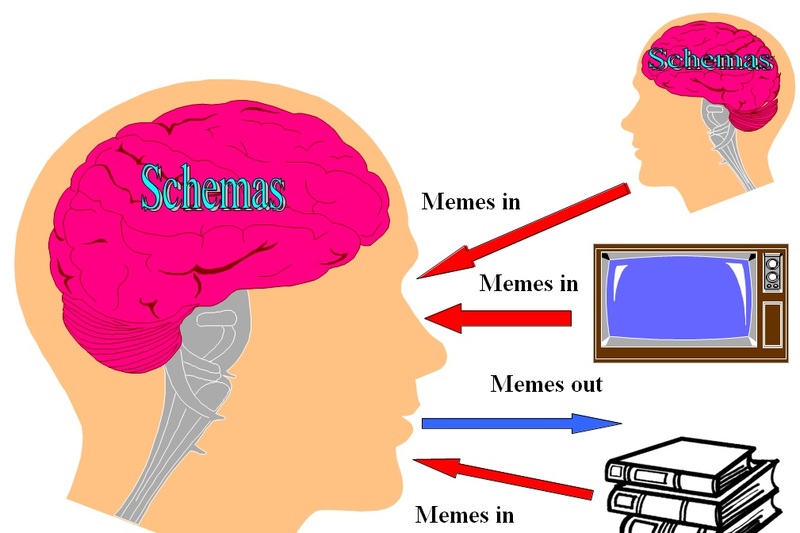 There are situations where schemas exist internally in someone’s thoughts and and are never transmitted out (via speech or behaviours such as writing) to become external memes; and there are containers for memes independent of the human brain – eg: unread books. How one individual’s schemas become memes, infect others and change the schematic structures in the recipients’ mind-brains is a key component in understanding how people persuade each other and how both informational and normative social influence are created. Chris Cowan & Natasha Todorovic (2006a) put it succinctly when they talk about “memes playing out as schema – actions, beliefs, behaviours, mental scripts and anchors for perceptions”. Immanel Kant, the great 18th Century German philosopher, is usually considered to be the first to use ‘schema’ in the sense it is used here. Leading early 20th Century British neurologists William Halse Rivers & Henry Head (1908) established structural biological bases for schemas in the brain; and Jean Paiget, the pioneering child developmentalist, (with Valentine Châtenay, 1923) conceived the idea of a biological schema developing through interaction with the external environment. The concept of the schema in contemporary Cognitive science is perhaps most directly traceable to the work of British Cognitive psychologist Fredrick Bartlett (1932). Bartlett, a onetime student of Head, was interested in memory, and in particular in the notion that the context of an experience had crucial effects on what was retained and how well this was recalled. From his famous ‘War of the Ghosts’ experiments, Bartlett saw a schema as a component of memory which is formed from encounters with the environment, and which organises information in specific ways. In contrast to the relatively-long history of the ‘schema’, the ‘meme’ was only invented in 1976 for Richard Dawkins’ book, ‘The Selfish Gene’. However, the study of the meanings used in communication in a culture has been at the heart of Symbolic Interactionism since its foundings in the 1920s – Alfred Schutz (1932) referred to shared meanings as ‘typifications’. Dawkins was postulating the idea of a second replicator – ideas which beget ideas – following the first replicator of Evolutionary Theory: genes. (Hence, memes rhyming with genes!) From Dawkins’ ideas came the neo-science of Memetics. Others – not least Susan Blackmore! – have taken Dawkins’ ideas much further, especially in terms of developing Evolutionary Psychology. One of the key ideas Blackmore has put forward, to reduce it to basics, is that the infection (input) of ever more complex ideas and the need to digest and work with such ideas has, over many millennia of time, driven the evolution of the human brain. In other words, bigger ideas require bigger brains. This ties in with but extends exponentially Tim Crow’s (2000) theory that the acquisition of language was the real driver in the development of brain size and human intelligence. When Don Beck & Chris Cowan (1996) popularised the work of Clare W Graves as Spiral Dynamics, they used the term ‘vMEMES’ for the distinctive and systematic core ways of thinking Graves had identified. They saw vMEMES (or Value Memes) as the organisers or attractors of memes. So, for example, the PURPLE vMEME will relate to ideas about safety and belonging, RED will favour concepts about power and self-expression…and so on. This reflected Graves’ original thinking, though he used themas for the systems he identified and schemas for the cognitive concepts which related to each thema. To avoid confusion, it is proposed in Integrated SocioPsychology that the external idea – how ever contained and transmitted – is considered to be the meme and that the idea embedded biologically inside a person is the schema. Our own schemas may also emerge as memes to infect others. Memes can also be stored in media such as songs, books, films and television programmes and infect our mind-brains from those sources. However, if the songs aren’t listened to, the books remain unread and nobody watches the films and television programmes, then it is impossible for those memes to replicate from those sources. Memes which fail to be transferred to other mind-brains effectively fail to replicate. The idea is ignored and, in time, it may even cease to be. The more mind-brains that internalise a meme in their schemas, the more powerful that meme is and the more likely it is to replicate even further. So how is it that some memes replicate better than others and some memes even ‘die’? Songs that get heard but not many sing. Or books that get partially read and are then abandoned. Graves (1971b) gave us some of the answer to this when he argued that each thema related to preferred schemas. Beck & Cowan made this more explicit by renaming themas ‘vMEMES’ and linking the Gravesian systems to Memetics and the replication of memes. Thus, it is possible to understand why the memes of a philosophical and reflective film like ‘Ghandi’ would appeal to people with high GREEN in their thinking but wouldn’t have the excitement, action and power displays to sustain RED’s interest . Similarly, the wanton slaughter of Arnold Schwarzenegger’s enemies in his early movies would delight RED; but GREEN would find the contempt for human life displayed offensive. Obviously, certain memeplex structures fit much more with certain vMEMES than others. For example, organised religions such as the Roman Catholic Church or Sunni Islam are driven for the most part by BLUE. The memes which comprise the memeplex of Capitalism are fostered mostly via the ORANGE vMEME. So when we are faced with conflicts of ideas, philosophies, religions, etc, in order to understand what is going on, we need to analyse them in terms of memeplexes and the structure of those memeplexes – the lesser memeplexes within the greater memeplexes and the base level memes underpinning the whole structure. We also need to identify which vMEMES are driving the memeplexes. For example, someone wanting to follow the correct memeplex procedure for getting seated and served in a high-class restaurant is likely to have BLUE strong in their vMEME stack at that point in time. In the case of a visitor from a different country having dinner at your house for the first time, their PURPLE is likely to be trying to ascertain your meal-time customs so the visitor will find acceptance. The ultimate memeplex, according to Blackmore, is ‘I’, the cognitive awareness of self – who I am, how I think, what I feel, what I believe…why I am the way I am. Effectively the key confluence of what Fiske & Taylor call self schemas gives individuals their sense of identity or identities, Blackmore labels this the ‘selfplex’. vMEMES ebb and flow up and down the Spiral according to the life conditions people experience in their different environments. Effectively this means the memes with which they have to deal. Incoming memes either fit with our vMEME stack and the schemas we operate with – assimilation, according to Jean Piaget (1937) – or are ignored – even to the point of failing to impinge upon even short-term memory. However, what happens if a meme repeatedly challenges us by preventing us from having some element of fulfilment or even by threatening us? In accordance with Albert Bandura’s (1977) concept of Reciprocal Determinism – ie: we operate on the environment and the environment operates on us – we must change if we are to deal with the challenging meme(s) which can cause real discord in our schemas. Stress! The process of an incoming meme challenging a schema to the point where the schema has to be amended, Bärbel Inhelder & Jean Piaget (1959) called accommodation. What happens when someone accesses a new vMEME for the first time? Blackmore has proposed that successfully-replicating memes can cause brain development. This would mean that exposure to challenging memes in the right circumstances could activate the neural circuitry for the new vMEME to work – which would involve epigenetic modification.